Within Teamwork Desk you can create a bank of help docs which your customers can reference if they run into issues. To access Help Docs, select it from the Desk navigation bar to the top of Desk. To create a new doc, select New Article within the left pane of the help docs section. Note: You can create up to three layers of categories (categories are managed from the help doc are of settings and can only be accessed by an admin) to allow you to sort and organize these articles by topic. The docs section can be accessed from the Help Docs button in the left pane of your installation. When creating your first help doc you must give it a title. You can then add your help content in the main area and save to the right of the page when finished. You can format your text much like you can in any WYSIWYG editor. Before saving your article, be sure to select which category it is to appear in from the list in the right pane. 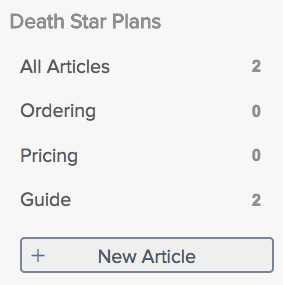 You can also add a single article to multiple categories. 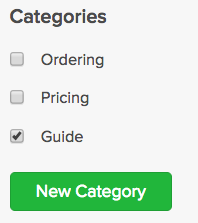 If you do not have a category create or need to create a new one by selecting New Category from the right pane. Related Articles - Allows you to select other articles which relate to the subject at hand. Links to these related articles will appear at the bottom of your published article. Revisions - Allow you to review previous versions of the document to allow you see how it has evolved. It includes information on when the previous version was created and by whom. Status - Set your article to: Draft, Unpublished, or Published. Preview - Click to open a new tab with a preview of how the article will look once published to the web. Display order (relevance) - The lower the number you apply here the higher it will appear in the search results. Redirect to your new help articles from previous site. You may already have your help article published on another site, so it has an existing web address. To redirect from this old URL to your new Teamwork Desk article, select the Advanced button in the upper right corner, enter the URL for the old article, and click on Save. Now anyone clicking on the link to the old article will be re-directed to the current one in Teamwork Desk.